While positive online reviews are a great way to help you grow your chiropractic practice and improve your Internet presence and search ranking, not every patient walks away happy with your level of service. Admittedly, sometimes their complaints are completely valid and include experiences that would upset even the most reasonable person. Yet, even if you technically do everything “right,” there’s always going to be someone who doesn’t mesh well with your practice for one reason or another, causing them to be dissatisfied with your office enough to share it online. Statistics provided by Help Scout (a web-based company created to help businesses improve their customer service strategies) suggest that you’re likely to hear from approximately four percent of these unhappy individuals. Certainly, some of them will share their dissatisfaction in person, but others will choose to post their complaints online in an effort to sway anyone reading the review from doing business with you as well. Since these types of reviews can impact your ability to increase your number of patients and SEO, coupled with the fact that bad news traditionally travels faster than good, it’s important that you handle them appropriately so it doesn’t impact your business in such a negative way. The internet is full of cautionary tales of businesses who have gotten into online arguments with customers, and it seldom ends well. After reading undesirable statements made about your chiropractic practice, it’s understandable that your first thought may be to lash out and let the reviewer know why he or she is “wrong.” However, taking this sort of impulsive approach will likely do more harm than good because it’s easy to say something you regret in the heat of the moment. Instead, Yelp suggests that you “give yourself a cooling down period” before doing anything. This enables you to formulate a response that is sound and based on helping you protect your business’ reputation as opposed to issuing a response based solely on emotion. Depending on the level of negativity contained within the review and your initial response to it, the length of your cooling off period may vary, but you don’t want it to go on indefinitely. How long is appropriate? Does Their Complaint Have Validity? Based on the person’s online review, on what he or she shared about the experience with your office, would you feel the same way? If so, then it’s necessary to address that issue immediately to keep other patients from feeling the same way. Another factor to consider is whether more than one person submitted a review containing the same type of issue. In this case, it’s likely that something in your office is broken (whether it is the people or process) and you’ll need to address it if you want to avoid getting more negative reviews about the same topic and making the rest of the world feel like you don’t care enough to take their concerns seriously. If it’s a process issue that needs addressed, then fix the way you do things so they’re more patient friendly or so your office runs more smoothly. If it’s a staff issue that was brought up, then address the patient’s concerns with your employees so they aware of the issue and can prevent it from happening again. And if you feel that their complaint lacks validity, Smith says to “consider seriously going the extra mile in making things right…this is an investment in your future success and your ongoing reputation.” In other words, even if you don’t plan to make changes based on their negative feedback, don’t just ignore the review because it can deeply affect the success of your practice. Once you’ve considered the complaint itself, Neg Norton, president of the Local Search Association, says that you “should engage the customer with a short and positive private response – either through the online review platform or via e-mail.” This way you’re able to recognize the complaint itself and potentially come to some agreement as to how to resolve the issue so the person is more satisfied with your office. Additionally, the reason for doing this privately, Norton says is to “prevent a back-and-forth that could draw even more unwanted attention to the review.” The last thing you want to do is engage in a heated debate online with the person as that will look worse for your business than the review itself. When you contact the person, it’s important to not be dismissive of his or her feelings or concerns or to come across as defensive as you’ll have a harder time reaching a resolution if you do. Also, if you’ve made changes to your office as a result of the review, now is a good time to share this information. The more the person feels heard and like his or her opinion is valued, the more favorable the response you’ll receive. Thank you for taking the time to submit your online review of our practice. Although, we’re sorry to hear that you’ve had a bad experience, namely with regard to [insert the person’s specific complaint here]. We do strive to provide all of our patients only the best in care and customer service, so we want you to know that we take your concerns seriously. Therefore, we’d like to talk to you directly about your experience so that we can take appropriate steps to resolve this issue in a way that neither you nor our other patients feel this way in the future. Please feel free to contact us directly at [Enter your preferred method of contact here] or simply respond to this email. We look forward to hearing from you and welcome any suggestions you may have about how to make our office even better! As you can see, this type of response doesn’t say who is “right” or who is “wrong.” It simply says that you’ve heard the person’s complaint (hence the reason for adding the specific complaint in your response) and that you’re taking it seriously. This is important when your final goal is to resolve the person’s issue in a way that turns an online negative review into a positive. Also, by asking for input as to how they recommend you resolve the issue(s), you’re also helping them see things from your perspective as they try to come up with a solution that they see as fit. Plus, they may even have a good idea that you’ve never thought of, making your chiropractic practice better as a result. Responding to the online review when the person had a negative response to your direct contact. Thank you again for writing this review and I’m glad that we’ve been able to resolve the issue with you directly. If you have any comments or questions in the future, feel free to share them with us as we value all of our patient’s opinions! This shows the people reading the review that you did act on it (showing that you’re responsive and care about your patient’s opinions) and that you were able to positively resolve the complaint (suggesting that the person is likely happier now than when he or she initially wrote the review). Thank you for writing this review and sharing your concerns about our office. We’ve attempted to reach out to you directly, but have not received a response. If you’d like to provide more details about your experience and/or see what we can do to resolve this issue, please feel free to contact us at [Enter Your Preferred Method of Contact Here]. We value all of our patients so we’d love to hear from you! This response alerts others to the fact that you’ve tried to resolve the issue but have been met with silence. This may cause them to see the initial review as simply “blowing off steam” by an unhappy patient who has no desire to resolve the issue but just wants to tarnish your name. Thank you for writing this review and I’m sorry that we’ve been unable to resolve the issue with you directly. However, we do want you to know that we take all of our patient’s concerns seriously and we are address all of them, making any changes necessary to create a more positive environment for our patients. By responding in this fashion, again, you’re telling everyone reading the review that you did attempt to resolve the issue with the dissatisfied patient, but couldn’t. It also says that, regardless of being at a standstill with the complaint, you still consider the person’s opinion valuable and you’re not just trying to sweep it under the rug or make it go away. The whole point of the response, no matter which one is appropriate, is to show that 1) you heard the complaints being made, and 2) you’ve taken actions to resolve them. Again, even if the only real action you took was considering the complaint because you’ve determined that it was a one-time incident or that it’s an invalid complaint (for whatever reason), you’ve at least taken some action on it. This is much better than doing nothing and pretending it doesn’t exist. 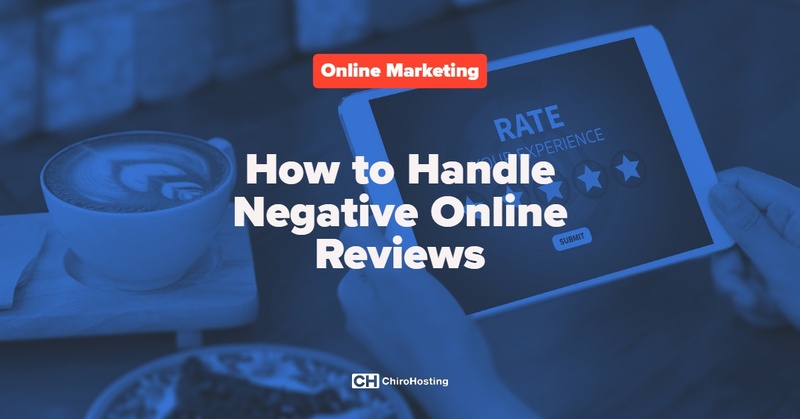 Most of the time, taking the previous four actions is enough to handle a negative online review in a way that it doesn’t do much damage to your chiropractic practice. However, sometimes you may want or need to take further action in an effort to protect or rebuild your business reputation online. One option to consider is to ask the review site to remove the review, but be ready to be met with resistance as The Review Solution indicates that “unless the content actually violates the Terms of Service, a site will not remove bad reviews.” In other words, unless the reviewer did something that the site itself prohibits (such as using profanity), the review will likely remain published. You could also potentially file a lawsuit against the person if the review contains libelous allegations or false information. But, keep in mind that, whether you win or lose, you may just get more negative publicity by taking this route. Perhaps one of the best actions you can take to help enhance your practice’s reputation after receiving a negative online review is to try to get more positive reviews so that the good ones outweigh the bad. This will help increase your rating on the 5-star scale and once people see that you have more happy patients than unhappy ones, they’ll give the negative review less weight. Managing your online reputation isn’t always easy, but it is definitely worth it. By paying attention to what your patients have to say about you and making them valued—even if you don’t like what they have to say—you’ll show that you’re genuine and true. That alone makes you someone that most people want to do business, ultimately turning a negative online review into a positive business-enhancing experience. If you need professional help managing your online reviews, please contact one of our marketing experts at (800) 295-3346. If you need help getting new reviews for your practice, check out our Chiropractic Online Review Building Service.